It is estimated that at least 40% of combat troops suffer from Post traumatic Stress disorder (PTSD) ~ a disorder that an individual is diagnosed with after being directly exposed to an extreme traumatic event such as witnessing an actual or threatening death experience, serious injury, or someone who has been fatally injured. 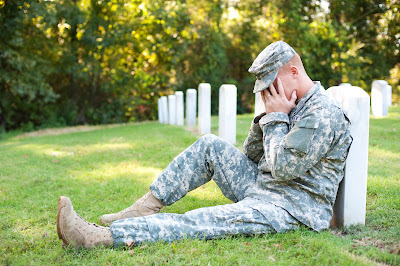 PTSD can also be triggered by a threat to one’s physical integrity or learning, or witnessing an unexpected or violent death, serious harm, or being threatened of death or injury by a family member or other close associate. The person with PTSD that is exposed to a particular event usually has experienced intense fear, helplessness, or a horror event ~ which results in disorganized or agitated behavior and usually reinforces earlier emotional separation where it then becomes an emotional block to joy and happiness. Many people who have PTSD have experienced the trauma event through military combat, violent personal assault (sexual and/or physical), robbery, mugging, taken against their will as a hostage, terror attack, torture, prisoner of war in a concentration camp, involved in various disasters, horrendous auto accident, or diagnosed with a life threatening illness ~ in other words civilians can also experience all the symptoms of PTSD. This post will share with you the experiences of a composite person who I will call Johnny, who has been diagnosed with PTSD as a result of being in the military and being exposed to a traumatic event. Johnny served in the military for 28 years and his last deployment was in 2007. Although it has been eight years since Johnny was active in the military, his experiences and the PTSD still impact his daily life today. According to the DSM-V, there are five symptom clusters for PTSD: stressor, intrusion, avoidance, negative alterations in cognitions and mood, and alterations in arousal and reactivity. Johnny, who is a composite of two actual combat veterans with PTSD as well as graduates of the Healing the Wounded heart (Band of Brothers) self-healing group, experienced multiple symptoms in each of the five clusters. With respect to stressor symptoms, Johnny witnessed the traumatic event of a military vehicle hitting an improvised explosive device (IED) along with witnessing the aftermath of what happened to those individuals that were in the vehicle collision as well as the individuals who were trying to save them which included himself. This event dramatically impacted Johnny as there was a shift in his personality, as he acted in unexpected ways before and after being deployed, which was particularly noticeable to those closest to him. He became constantly on edge, hyper vigilant, more irritable, easy to startle, and feared leaving the house and having social interactions when before, he was very easy-going and social. The event also impacted his transition to civilian life and his ability to cope with day-to-day stressors. Intrusion symptoms include having recurring, or reliving intrusive memories of the trauma. These symptoms include having traumatic nightmares, dissociative reactions such as flashbacks, intense or prolonged grief after the event and marked psychological reactions after being exposed to the trauma related stimuli. A month after Johnny returned from his deployment he started experiencing traumatic nightmares and was reliving the event over and over in his head. He started to feel a sense of responsibility of not being able to change the event and wanted to go back in time to that day and change the outcomes by thinking about what would have happened if the military convoy left earlier, took a different route, etc. The nightmares were so real to Johnny that he would relive the traumatic event in his dreams to the smallest details, from how pretty it was that night and morning, to the smell of explosive, diesel, dirt, etc. For months, Johnny experienced these nightmares daily when he first returned from the military. These days the nightmares are minimal but sometimes still impact Johnny’s sleeping habits. The impact of the recurring nightmares included lack of sleep, jumping out of bed in a pool of sweat, and a fear of getting a good night’s sleep. The lack of sleep, or getting to sleep further exacerbated Johnny’s feelings of being on edge. Experiencing the nightmares affected Johnny’s job performance at work as he struggled to concentrate on the task at hand and was eventually let go after two years after his return from combat. 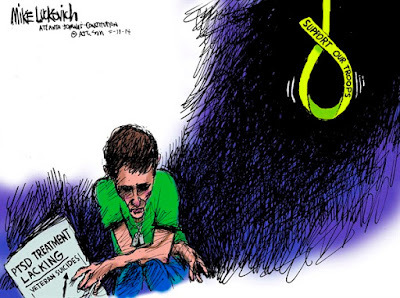 Isolation is the principle precursor to the rising Veterans suicide rate. To deal with some of these difficult life issues, and his growing isolation, Johnny resorted to abusing alcohol and pain killers. Although he had returned to the U.S, he lacked the ability and desire to follow his own path in life. In other words, although he had physically come home, he didn't feel as though he was really here. It was as if there was an invisible wall between him and life. There didn't seem to be much of a reason for life, survival or the future. He tried to hide from his real feelings, by using drugs and alcohol and lots of it. Johnny was so haunted by these memories that he didn’t want to keep remembering so he dulled his senses with alcohol and drugs. He self-medicated in order to avoid dealing with the issues at hand, thus delaying his recovery and reinforcing his isolation. Johnny also had problem remembering simple things, like what day it was, losing things, forgetting to bathe and brush his teeth, driving and forgetting where he was going. He also reported feelings of depression and feeling unmotivated to make behavior changes since his feelings of self-worth were also affected. Johnny would get in the car and start driving and then lose his train of thought and end up missing his destination. Johnny also became disorganized and had difficulty prioritizing his day. Johnny said he would keep from driving down crowded streets as well as heavily trafficked and loud places. As a result, Johnny didn’t like to drive in the mornings and evenings during peak traffic times, he felt like he was closed-in. In the military, Johnny was trained to constantly be on the move as to not be a sitting target, but while in the car and sitting in traffic, Johnny felt on edge because he could not control his environment and he was afraid that the next car was going to explode or another driver was going to take a shot at him. Johnny was always very defensive, jittery or irritated of other drivers, feeling like he was not in control, breathing heavily, sometimes pulling over to gather his thoughts to remind himself that he was okay and was not in the environment he left behind. Johnny avoided shopping malls and grocery stores because he felt stressed by the proximity of so many people around him, which caused him to hurry up and want to leave the threatening environment right away. Many times Johnny tried to avoid public events, because it would make him think that something bad was going to happen and he had to be on guard and keep focus of his surroundings. This caused his heart to race and be easily distracted rather than enjoy the event with the people he was with. For example, when Johnny went into a crowded store, he took notice of the exits in case he started to feel overwhelmed and needed a quick escape. He also sat with his back against the wall and a view to the door when eating at a restaurant. Johnny stated that he would avoid watching action movies that depicted combat or involved explosions and violence in order to not have recurring intrusive thoughts of his experience of combat. Watching such movies would cause him to have sudden flashbacks of the past and the events that occurred during the trauma. When the symptoms of the PTSD were really bad, Johnny’s wife noticed him wanting to stay home all the time, a sense of withdrawal on the weekends, and even at family gatherings.
. Johnny felt that there was a disconnect between him and society and he did not feel safe outside his perimeter (his house). It was becoming very difficult for John to manage his life. John also became very apprehensive of people who looked as though they came from the Middle East because he perceived them to be dangerous. Lastly, Johnny also experienced a diminished interest in (pre-traumatic) hobbies and leisure. For example, prior to the event, Johnny was interested in gardening, bike riding, and doing outdoor activities. After the traumatic event, Johnny lost his motivation and desire to work in the yard, riding his bike on trails, or wanting to go for nature walks. Another symptom caused from experiencing negative alterations in cognitions and mood was Johnny having these constant sudden anger responses when confronted, and reactions to stressful situations were not favorable, and were affecting his concentration. This occurred during times of stress that triggered a “fight or flight” response, such as someone cut him off while driving. Johnny started noticing these constant undesirable responses, and that they were affecting his physical and mental health; being able to recognize familiar things, such as remembering to turn at a familiar exit. To cope with such undesirable responses, Johnny learned to separate himself from the situation, by leaving the environment and taking a walk, or pulling over to a safe area and taking time to calm down, and putting things in perspective. The final symptom of PTSD is trauma-related alterations in arousal and reactivity that begin or worsen after the traumatic event. In Johnny’s experience, he developed irritable and aggressive behaviors. For example, when Johnny went out to family events and in groups he had a low tolerance for people who were rude and negative and he wanted to confront such people about their wrongdoing and would get into physical confrontations in order to control the situations. Johnny also experienced hypervigilance and was always looking at his surroundings and noticing who was where and identifying his safe zones. Johnny shared that when he experienced the hypervigilance he noticed that every muscle within his body tightens to a flight or fight response. Moreover, Johnny shared that it was noticed by his friends and people who were around him that if there was a sudden loud noise, John had the reaction of jumpiness, was startled, and lost the ability to concentrate because he became so focused on where the noise came from. This reaction of being startled bothered Johnny because he was always tense, and upset with himself that he reacted to all sudden loud sounds and sudden movements in his close proximity. To this day, Johnny is still working on trying to contain how he reacts to loud noise and attempts to not lose his concentration. The single most important act for Johnny to come out of his self-imposed isolation shell and avoid suicide, although he attempted it twice, was reaching out for help ~ starting with the VA and ending up with the Vets Center and the Healing the Wounded Heart program and Band of Brothers self-healing support group. The support and encouragement he felt in these groups greatly facilitated his eventual self-healing. Johnny has developed his coping skills mostly through his association with the Veteran’s Administration and his participation in the heart centered Healing the Wounded heart program in Northern California ~ where he saw other veterans learning to cope with their problems and finding inner direction. Some of the strategies that Johnny has learned from the Vet Center to help him manage his symptoms were grounding, living in the here and now, proper breathing techniques, and living in gratitude as well as other heart centered strategies. Johnny also participated in cognitive behavior therapy, and getting treatment through integrative medicine treatments such as acupressure, acupuncture, and massages to help with some of the symptoms of his PTSD. Learning and experiencing the helpful tools that do assist with dealing and coping with PTSD ~ Johnny has gained a new perspective on life. He has learned to control his symptoms, and this has resulted in an ability to establish a positive relationship with himself, his family and the people around him. But living in gratitude has changed the way he sees life and has brought joy into his life. His recent Master's Degree in Recreational Therapy has set him on a career path which he can thoroughly enjoy as well as make a difference. He is now saying Yes to himself and is no longer controlled by fear. "The Healing the Wounded heart (Band of Brothers) program taught me how to get back in touch with that part of myself that really matters ~ the part of me that really never left home. Now, my spirit has value and meaning. Now, I am capable of standing up on my own. I have faith in my own abilities. I am truly home now, and I see that happiness is my purpose in life as well as service to my fellow veterans. I am enjoying life more and more and my need for anything that clouds my perceptions of it has gone away." Johnny came home when he basically learned to love again and his heart was awakened through gratefulness. Once that happened , he felt the joy beneath his fear and anxieties and he was once again in service ~ but this time from his heart. "The key to the kingdom of heaven is Gratitude and God only reveals itself to a grateful heart"